Visit Perimeter Mall in Dunwoody, Tuesday Night to meet your local Police Department and to climb on a SWAT vehicle. On Tuesday, August 1, 2017, Police Departments from the cities of Brookhaven, Dunwoody, Johns Creek and Sandy Springs will host the 34st Annual National Night Out (NNO) event. This community event will be held from 6:00 p.m. to 9:00 p.m. at Perimeter Mall, located at 4400 Ashford Dunwoody Road in Dunwoody. In the corner parking lot adjacent McDonald's. This year, the four hosting Police Departments will have patrol cars, SWAT vehicles and other specialty vehicles on display. The Sandy Springs Fire Department and the DeKalb County Fire/Rescue Department will also have fire trucks and other pieces of equipment on display. Police Officers and Fire/Rescue personnel will be on hand to answer any questions related to vehicles, personnel or public safety operations. 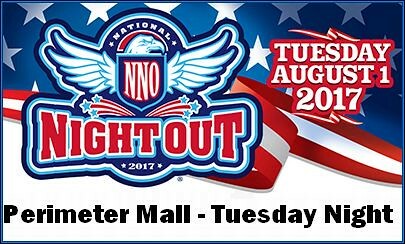 For more information about the 2017 National Night Out event, please contact the Dunwoody Police Department’s Community Outreach Officer, Mark Stevens, at 678.382.6917 or at mark.stevens@dunwoodyga.gov. Little kids get ready for the Great Popsicle Race at Dunwoody High on Saturday - bring kids socks to donate. 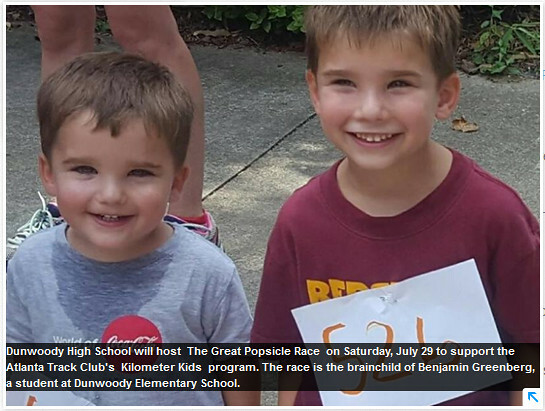 Saturday, July 29 at 9 a.m.
Dunwoody High School will host The Great Popsicle Race on Saturday, July 29 to support the Atlanta Track Club's Kilometer Kids program. The 3rd annual race is the brainchild of Benjamin Greenberg, a student at Dunwoody Elementary School. "He wanted to share his love of running with his friends, and he wanted them to run a race with him and get a popsicle at the end," said Lauren Greenberg, Benjamin's mom. Benjamin planned the route, wrote all the bib numbers and cut out the finish line. 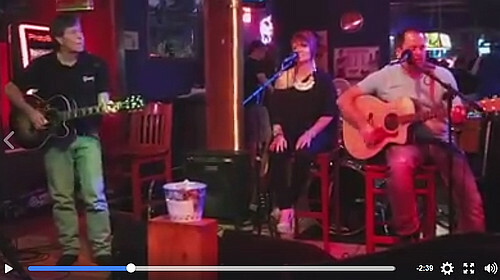 "We are excited about the support from the community and from neighborhood businesses. It looks to be the best year yet," Greenberg added. All children who want to run must register. The race course is 1 lap around the track at Dunwoody High School. SECOND READ: Temporary Construction Easement Agreement for Taylor Morrison - Perimeter Center East - New Trail tie in between Georgetown & Perimeter. Resolution Appointing a Member to Serve on the Alcohol License Review Board. Resolution Creating the City of Dunwoody Public Facilities Authority. This will greatly assist the Dunwoody Nature Center in allowing them to raise funds as it allows long term lease rights. Adoption of Comprehensive Transportation Plan Update. This update to the plan provides reprioritized project tiers that have been sorted based on their anticipated project time frames of completion (short-, mid-, and long-term). These tiers have been updated to account for any projects that have been completed, any that are in progress currently, and any new projects that have been identified through comments received from the public as well as other planning efforts undertaken since the 2011 CTP. 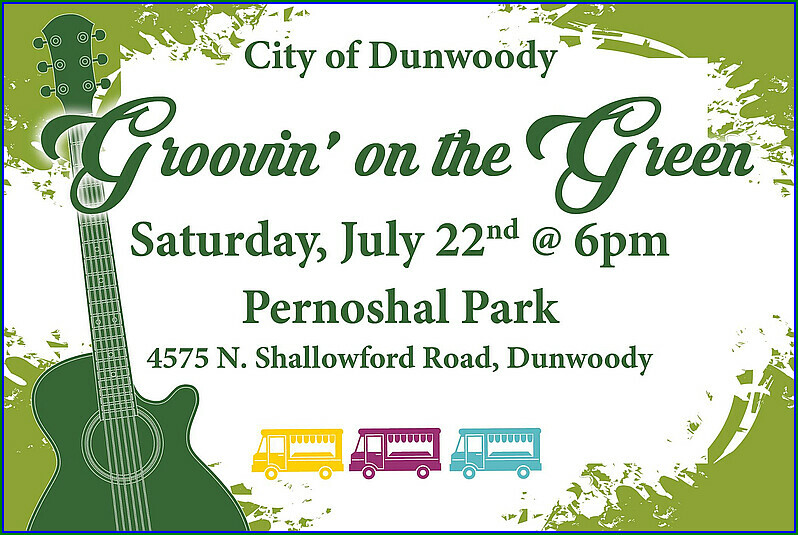 The City of Dunwoody presents Groovin’ on the Green, a FREE family-friendly concert on the lawn at Pernoshal Park (4575 N. Shallowford Road, Dunwoody)! Get your family, friends, or neighbor and let’s get Groovin’ on the Green. The concert features Darlington Road, performing a variety of music including Chris Stapleton, Michael Jackson, Hall & Oates, the Commodores and everything in between! Food trucks on site will include: Grubbin’ Out and South of Philly, as well as Alcohol Heroes and King of Pops! Pull up a lawn chair or a picnic blanket and enjoy the show! Parking: Overflow parking is available at Brook Run (4770 North Peachtree Road, Dunwoody) and Georgetown Park (4400 Dunwoody Park Drive, Dunwoody). Brook Run Park and Georgetown Park are connected to Pernoshal Park through the Dunwoody Trailway. Pernoshal Park parking lot along with adjacent Emory Healthcare parking lot can accommodate approximately 200 cars. We are going to have a great time and hope to see you there! Former Chesnut Elementary student provides outstanding community service as a Dunwoody Police Officer but could he live here today? Yesterday something crossed my desk that I thought I would share. 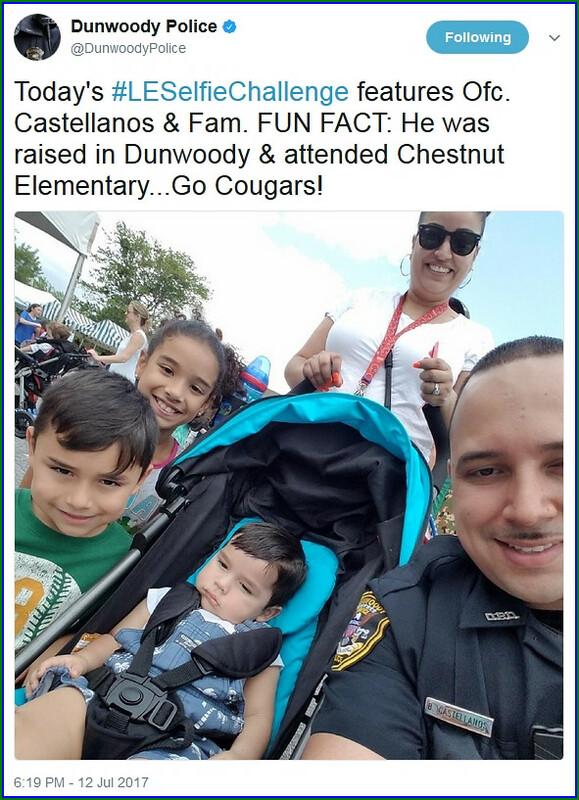 I saw a tweet by the Dunwoody Police Department honoring the fact that Officer Castellanos was raised in Dunwoody and attended Chesnut Elementary just blocks from my home. Unsure of where Officer Castellanos lives today, knowing the caliber of our staff and seeing his beautiful family, I wish he was my neighbor as I believe he should have the opportunity to live back in Dunwoody. Having police officers available locally is a benefit to the Department and the Community, especially in times of emergency or extreme weather. The Dunwoody Police Department has a great benefit package for our police officers and we have very high standards for those we hire but the starting pay for a new officer is just above $40,000 therefore living here in town would be very difficult. With new cities coming on board police salaries across the state have raised therefore Dunwoody works hard to hire the best entry level officers we can find but we need to continually evaluate our benefits package against other departments to set recruitment & retention strategy. One of the benefits of being a Dunwoody Police officer is that every officer gets his own take home police vehicle whereby the city pays for the fuel to & from work. Though I agree with this policy, it is also detrimental to encouraging officers to live locally therefore at the start of the city we also pushed for a local residential stipend, currently at $300 per month for those officers who live within the City Limits. In our budget discussions this year, besides over all salary, I will be looking to have the local stipend raised, will question out of pocket financial costs of the officers and will look to increase tuition reimbursement. As a City Councilman, I am always proud to witness a new officer being sworn in to the Department but the churn or turnover of officers leaving for other departments makes me question if we have the right policies in place and I take that responsibility very seriously. We currently have openings available to be a Dunwoody Police Officer and if you are interested, please apply. 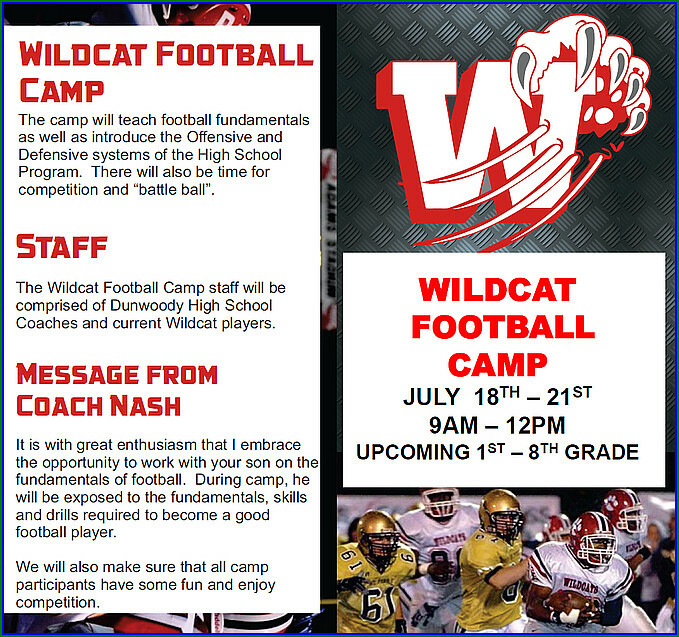 Dunwoody Wildcat Jr. Football Camp for 1st / 8th Grade - July 18 - 21. Wear shorts, tshirt, sun-screen & tennis shooes. Bring cleats & water bottle. Dunwoody City Council takes up signs & parks master plan on Monday July 10th. Proclamation - Parks and Recreation Month. Approval of Project Agreement with Georgia DOT for Georgetown Gateway Project. Funding Approval for Stormwater Repairs at 2542 Bentbrook Drive. Funding Approval for Stormwater Repairs at 2222 Dartford Drive. Resolution to Appoint Member to Serve on the Alcohol License Review Board. Approval of RFQ 17-03 Standby Skilled Trade Contractors. Contract Award for the Donaldson Bannister Farm Site Improvements. FIRST READ: Temporary Construction Easement Agreement for Taylor Morrison. Approval of Parks and Recreation Master Plan. Discussion Brook Run Park Baseball Fields Construction. Dunwoody Homeowners Association hosts Georgia's Largest 4th of July Parade - kicking off at 9 a.m.
On Tuesday, July 4, 2017 at 9:00 a.m., the Dunwoody Homeowners Association and the Dunwoody Crier Newspaper will host the annual Fourth of July Parade featuring marching bands, floats, clowns, animal units and local celebrities. Last year the parade attracted over 2,500 participants and 32,000 spectators! This year’s theme is A Small Town In A Big City, and the Grand Marshall is Alan Mothner. The parade route is two (2) miles, starting at the intersection of Mount Vernon Road and Jett Ferry Road at 9:00 a.m., proceeds west on Mount Vernon Road to Dunwoody Village, turns right onto Dunwoody Village Parkway. Viewing Information: Parade spectators are encouraged to setup chairs along Mount Vernon Road and Dunwoody Village Parkway (up to the shops on the right and the parade entrance into Dunwoody Village.) Spectators will be blocked from viewing the parade on the east side of Jett Ferry Road on Mount Vernon Road due to the staging and setup for parade participants. Viewing will start on the west side of Jett Ferry Road on Mount Vernon Road. 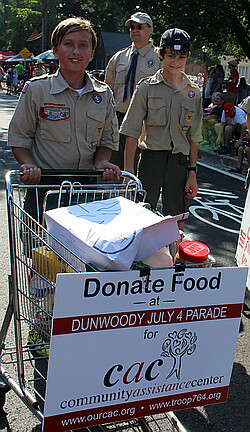 Dunwoody Boy Scout Troop 764 from St. Luke’s Presbyterian will collect food along the parade route for the Community Assistance Center (CAC) Food Pantry. The troop plans to enter a scouting themed float in the parade and will be pushing grocery carts along-side to collect the food donations. After the parade join in the fun at the post parade festival in front of the U.S. Post Office in Dunwoody Village for family fun and great food!